Pan Kyi, was born in Myanmar in 1983, and graduated from the University of Culture in Yangon. 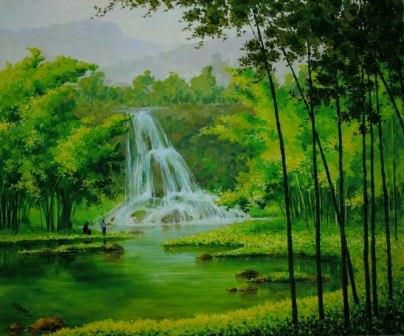 He expresses his deep love for nature and his country through this paintings. 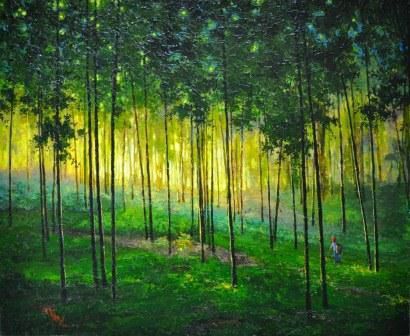 He does not paint merely from being inspired by the land, rather, he paints inwardly; painting his own interpretation and perspective of the world. Pan Kyi loves quiet, empty spaces that bespeak solitude and peace. He believes that sometimes people hold memories of places they visit and a lot of the emotions they experience are deeply personal and tend to be appreciated in silence. The bamboo stalks and leaves catch the sunlight from the gaps in the trees, creating a mysterious sense of depth and shadow. A small, yet extremely significant, figure usually walks through the vastness. Pan Kyi's compositions provide us with a quiet place, a sanctuary where we can reflect inwards. Pan Kyi meditates on a vision of natural beauty. His works represent an ability to find peace and contentment, even when the leaves change colour.